The Neue Schule NS Lightweight Mors L'Hotte Weymouth (Veritcal) is ideal for horses that have insufficient room in the mouth to accommodate a conventional Weymouth. 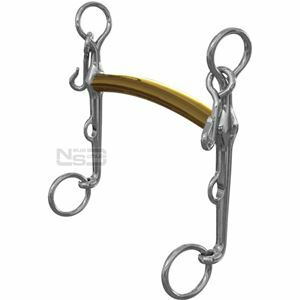 The NS Lightweight Mors L'Hotte Weymouth (also known as a French Curb) is ideal for horses that do not have much room in the mouth and is also extremely benficial for horses that are strong, but sensitive at the same time. The mouthpiece of the NS Lightweight Mors L'Hotte Weymouth traces out a subtle convex arc in alignment with the curb cheek shanks, and exerts gentle even pressure across the tongue. This weymouth and does not abude the outer edges, nor does it roll forwards onto the thinner more sensitive area of the tongue. This action promotes comfort and has consistently proved to eradicate tongue evasions in most horses. Since extra room is created when using the NS Lightweight Mors L'Hotte Weymouth, a thicker bridoon may be employed with this curb if required.